Karthika Gnanamrutham was organized on 21st November 2016 for the students of Classes VIII to X in Bharatiya Vidya Bhavan’s Sri Venkateswara Vidyalaya, Tirupati. The programme began with Bhavan’s prayer. Dr.N.Satyanarayana Raju, Hon.Director & Treasurer, in his address said that one should inculcate spiritualism at a young age to lead good and valuable life. He recalled Shri K.M.Munshi, the founder of Bharatiya Vidya Bhavan who took keen interest in promoting Vanamahotsav, Indian culture and tradition. The day’s Chief Guest Dr.Rani Sadasiva Murthy, Associate Professor, COE Audio Visual Projects’ Director, Rasthriya Sanskrit Vidyapeeth, Tirupati speaking on the occasion, he elaborated the significance of Telugu calendar. He also stated that listening skills play a major role in students life and cited some examples of routine experience. He further quoted that Physical , Psychological, Intellectual Spiritual and Social fitness are important to lead a complete and perfect life. In addition, he said that taking a dip in holy rivers, lighting of lamps and noble deeds like charity done during this auspicious month can lead to enlightenment. He talked about the importance of ‘Vanamahotsavam’ which promotes communal harmony and Social relationship among people. 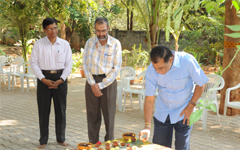 The guest was felicitated by Dr.N.Satyanarayana Raju, Principal and Vice Principal in the midst of staff and students. As Karthika being an auspicious month, trees like Banyan, Peepal etc are workshipped. The following day i.e. 22.11.2016, students of Class VII and Apex Body participated in Vanamahotsav. On this auspicious occasion, Prof. K.E.Devanathan, Vice Chancellor, Sri Venkateswara Vedic University, Tirupati shared his views on protecting the environment. In his speech, he said that it is our age old tradition to worship trees as they give us timely rains, oxygen, food, medicine etc. These kind of programmes enlighten the goodness of trees. 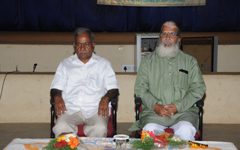 He appreciated Dr.N.Satyanarayana Raju, and Staff for conducting such programmes. Sri Pola Bhaskar, I.A.S., Joint Executive Officer, T.T.D., Dr. Medasani Mohan, Kendra Committee and School Managing Committee, and other dignitaries participated in the programme.